One word to sum it up: Out-of-it. I remember when I first saw the Knight and Day trailer at the cinemas. I think I could actually taste the popcorn becoming a lot more buttery when I saw it. To me, it's the epitome of a typical brainless popcorn blockbuster. My dad went to go see it while I watched Inception, and he hailed it as 'the best Cameron Diaz movie of all time'. Not that there are many great Cameron Diaz movies out there, but yes, Knight and Day ranks among the best. That's if you aren't opposed to plot holes big enough for King Kong to get through and the most silly action sequences ever. June Havens (Cameron Diaz) is just a normal woman going about her day. She gets a flight back home, but on that flight she meets the mysterious Roy Miller (Tom Cruise), who happened to kill everyone aboard the plane. The next morning, June finds herself at home, with everything back to normal. But as the day progressses she is thrown into a mission with Miller, and has to work with him in order to keep herself safe. Things won't ever be the same for either of them. 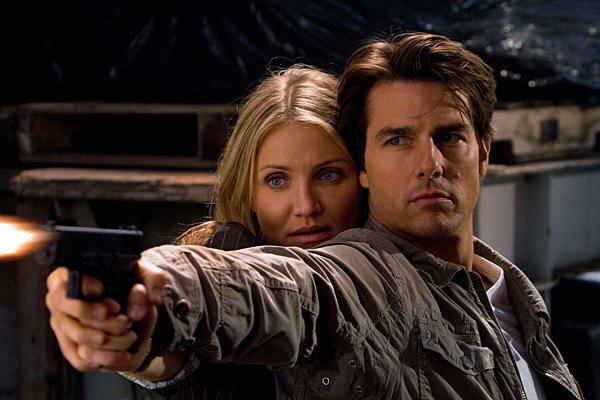 Knight and Day has little substance, little style, but manages to be a bit better than the average blockbuster. Okay, so, some of the action sequences we see out lead characters in are a bit over the top and totally unrealistic, yes, but is it entertaining? It's amazingly entertaining. The movie has some of the best action sequences I have seen this year, and is nonetheless a film which is driven by it's star power. Don't let Tom Cruise put you off...he's actually quite good in this movie. Cameron Diaz shows us all that she has a good set of lungs and can scream louder than the usual damsel in distress. Surprisingly, Cruise and Diaz have a rather good on screen relationship, and the comedy comes out of their mismatched pairing. The first half of Knight and Day sets off to be a comedy, and it does well at this. But the second half brings in the seriousness, which feels out of place when I felt I couldn't take the movie seriously. Unfortunately, things got a little tired as the movie progressed, and I started to see the cracks in this film. Sit back and enjoy the ride is my advice, because this is no doubt an enjoyable film. Hats off to the casting directors for getting Cruise and Diaz, and also my personal favourite Peter Sarsgaard in an action film. Knight and Day is no doubt just a blockbuster, but it can elevate itself past that status because of it's star power and out there action sequences, where we know that they aren't fighting 'just because they can' (ahem, I'm looking at you, Transformers: Revenge of the Fallen). THE VERDICT: Average blockbuster fun that offers few surprises, but is still as cool as Cameron Diaz.